Hate Rising; How Can We Protect Human Rights? Mr. Ramos meeting with a white Nationalist. Jorge Ramos is a famous reporter in Miami. He created a documentary to show people how hate is rising in this country by the things that are happening today. 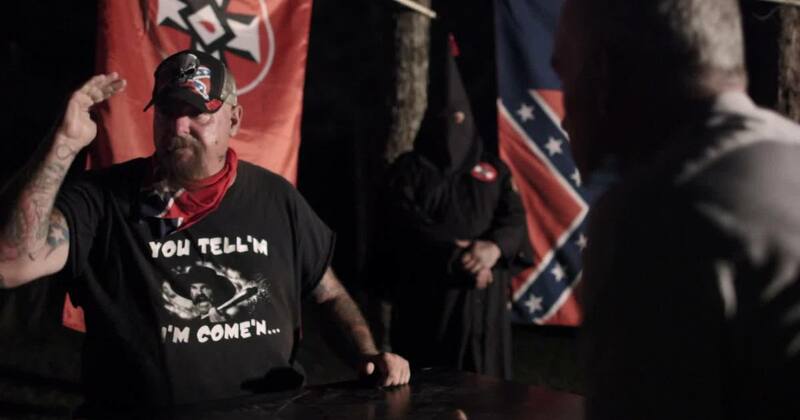 First, Mr. Ramos went to speak with one of the leaders of the Ku Klux Klan. When Mr. Ramos was there talking with him, he tried to be nice with him and he started to ask some questions to this leader but the leader just was there trying to avoid Mr. Ramos. This leader tried to make Mr. Ramos feel miserable just by the way he talked. One of the questions Mr. Ramos asked was: what are you doing if you meet an immigrant? his answer was: kicking him out and sending him back across the border. Also, the leader of this group said that if you came illegally to this country you don’t have any rights here. Another of the topics that Mr. Ramos added to this was: We can’t stop talking to people just because of their race or because of the color of the skin. These were words that Mr. Ramos said before his visit. Mr. Ramos went to a Muslim family to talk with Asma Mohamed on October 30 2016. She was discriminated ot Applebee’s restaurant by a white woman just because she was talking her native language with her family. So this white lady told Asma, “If you are in America you should speak English.” Jodie, the white woman, hit Asma with a beer mug. The worst thing was that Asma was there with her kids. Today many Muslims families are paniced about what Donald Trump is going to do with them. Mr. Ramos is trying to demonstrate that the Donald Trump presidency does not show fairness or justice in America. He demonstrated that reporting work is not that easy as it seems. Mr. Ramos went to talk with Mr. Jared Taylor one of the most known white nationalists in America. Mr. Taylor is in charge of a group that believes white people are superior to the black, brown and yellow people. Mr. Ramos went to meet Mr. Taylor and they were talking about different topics. When Mr. Ramos asked Mr. Taylor if he wants to live in a whites only country he answered that not necessary in a white only but he would like to live in a European type of culture. When Mr. Ramos asked him how is he going to achieve it. He said that Mr. Trump has many steps to accomplish it, like no more illegals coming to this country, and he wants to send all the immigrants back to their country. Mr. Taylor believes that Latinos want to make white Americans as a minority. After that he told Mr. Ramos to get out of his home. Based on this you can see how many people are being filled with hate. These same people seem to have voted for Mr. Trump because of his words about others. Mr. Ramos was kicked out from a conference when Mr. Trump was doing one of his debates just because he is an immigrant and Trump did not answer what Mr. Ramos asked him. One of the security people told him that he had to go back to his country. If Trump says that he is not a racist then his actions show he is a liar. In this video you can see why Mr. Ramos is trying to demonstrate why he thinks this country is out of control with the things that are happening this days. The solution to this problem will come if we as Americans can listen to each other and work to be more united. Americans should be people who stand first for Human Rights and that means respect for all people. I think this hate for the Immigrant that some Americans have is not new. what Trump did was take advantage of this hate in his presidential campaign. He Opened the door of hate that was locked for many years. It how Trump won the presidency. Now, his supports feel Invincible, forging those their called robbers are the most working people that they have in this country. From the beginning of his campaign, Donald Trump has influenced many americans to act upon sudden hate towards immigrants. Seems as if Trump has given the freedom or right for people to be/act racist. Nobody feels safe anymore because of all the racism going around. There really is no point to hate other races. They are people just like them, they might speak a different language or have a different religion. The fact still remains that were are the same human beings. For those people that are racists? I ask one thing.. Why? why is there a need to hate another ethnicity? were the same, the only thing that we might not have in common is language and skin color. But we remain the same. Maybe someone earns more money than the other one and has better things. But we bleed red and that makes us equals. At the end of the day we still remain human beings.